A brief mindfulness intervention diminished bias in favor of one’s in-group and against one’s out-group. In the linguistic intergroup bias (LIB), individuals expect in-group members to behave positively and out-group members to behave negatively. Consequently, individuals choose abstract language beset with character inferences to describe these expected behaviors, and in contrast, choose concrete, objective language to describe unexpected behaviors. Eighty-four participants received either mindful attention instructions (observe their thoughts as fleeting mental states) or immersion instructions (become absorbed in the vivid details of thoughts). After instruction, participants viewed visual depictions of an imagined in-group or out-group member’s positive or negative behavior, selecting the best linguistic description from a set of four descriptions that varied in abstractness. Immersion groups demonstrated a robust LIB. 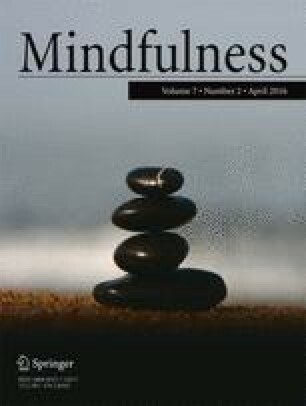 Mindful attention groups, however, exhibited a markedly tempered LIB, suggesting that even a brief mindfulness related instruction can implicitly reduce the propensity to perpetuate stereotypical thinking through language. These results contribute to understanding the mechanisms that facilitate unprejudiced thinking. The online version of this article (doi: 10.1007/s12671-015-0450-3) contains supplementary material, which is available to authorized users. We are grateful to Esther Papies for sharing her mindful attention instructions and for her many helpful suggestions, to Brian Ostafin for his informative discussions, to Anne Maass and Karen Douglas for their materials, and to Nancy Bliwise and Sheila Tschinkel for comments on an earlier version of this manuscript. Work on this article was supported in part by National Institute of Health Ruth L. Kirschstein National Research Service Award 1 F31 AT007130-01 and 5 F31 AT007130-02 to Lauren (McDonough) Lebois at Emory University. Lakens, D. (2013). Calculating and reporting effect sizes to facilitate cumulative science: a practical primer for t-tests and ANOVAs. Frontiers in Psychology, 4, 863. doi: 10.3389/fpsyg.2013.00863.